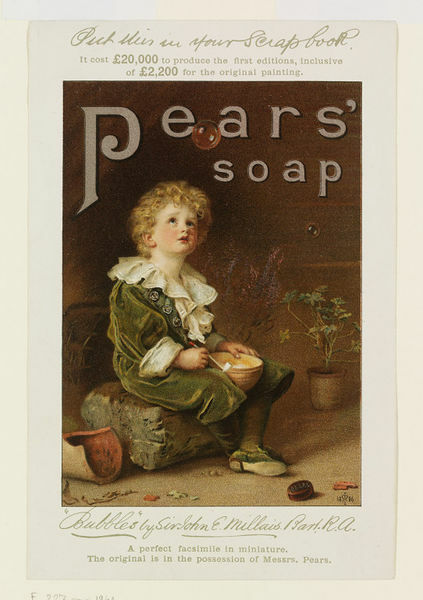 Facsimile chromolithographed presentation print from a poster for Pears Soap featuring a child playing with bubbles, from a painting by Sir John Everett Millais, adapted by the addition of a bar of Pears Soap in the lower right corner. 'Bubbles' by Sir John E. Millais Bart. R.A. / A perfect facsimile in miniature. / The original is in the possession of Messrs. Pears. 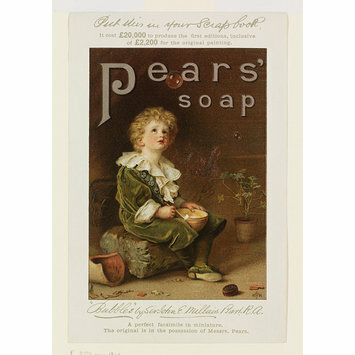 Facsimile presentation print of a poster advertising Pears Soap, from a painting by Sir John Everett Millais, 'Bubbles', colour lithograph; British; ca. 1889.